In a news cycle still perpetually tuned in to the twin calamities of the government’s progress toward Brexit and the various assaults on liberty by President Donald Trump, there is one story which has for the last fortnight or so led audiences to believe that sometimes there can be happy endings to potentially disastrous beginnings. 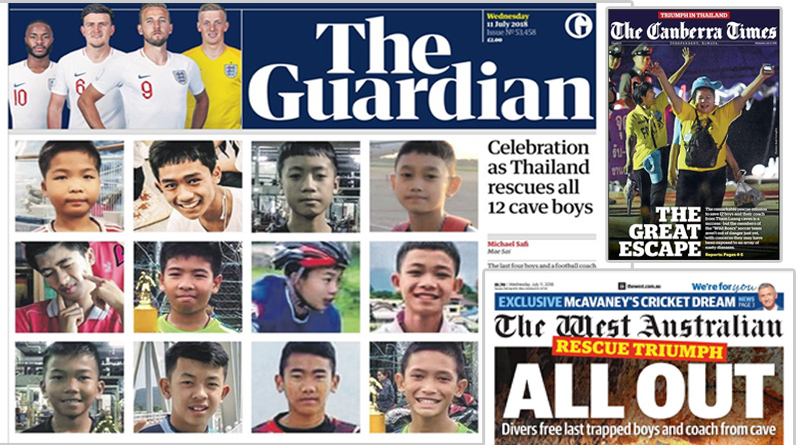 I’m not writing about the World Cup but of the #ThaiCaveRescue which reached its joyful finale on Tuesday when, after seventeen days of uncertainty, 12 boys between the ages of 11 and 17, and their football coach, were rescued from flooded underground caves in Northern Thailand. When the boys were first reported missing, hopes for their location and salvage were limited. But when they were found by divers last week, having been lost for over 9 days, the worlds media descended en masse to cover the rescue operation. And why wouldn’t they? This is a story that has everything – danger, intrigue, courage, mystery, hope and in the form of global cooperation (The US military, British divers and experts from Japan, China and Australia all aided the Thai authorities) it also showed what humanity could achieve if it pulled together. It was also universal in other ways– the horror of missing children transcends cultural and geographical barriers to unite people. So it is all too rare that events like this can capture the attention of the world and end in triumph. Rare, but not totally unheard of. In terms of the media coverage at least, there are remarkable parallels with the 33 Chilean miners who, before they were rescued in 2010, were trapped for 69 days some 2,000 feet below ground. In the immediate aftermath of the accident, coverage of the disaster dominated Chilean television but the story only began to gain global prominence, when, after two weeks, evidence began to emerge that all 33 men were alive and relatively well. Then, as César Jiménez-Martíne has pointed out Camp Hope—the improvised town that had grown up around the mine—was visited by a growing number of international media workers with more than 1,500 professionals representing 250 media organizations. And when the rescue took place – which took 22 hours – it was watched live, at certain points, by a billion viewers. Such was the interest in the event, that the BBC sent 26 of its staff to Chile at a cost of over £100,000 . This outlay, which saw the Corporation cut back on its reporting of other international events, was done because of audience interest. As the then BBC’s world news editor, Jon Williams, wrote at the time: the BBC news channel was attracting record viewing figures and More than 8 million people read the coverage of the miners’ escape on the BBC News website. The men who emerged from the San Jose mine of course saw their lives completely transformed and had to contend not only with the trauma of their experiences but also with the pressures of newly acquired global celebrity. If this tells us one thing its perhaps that the ordeal for the young footballers and their coach (who himself is only 25) is only just beginning. But after the euphoria dies down and the media crews pack away their equipment it would be wonderful to think that the boys can return to their lives equipped to cope with what has happened to them and that the world’s media gives them space to do so. The early signs are encouraging – they appear to physically in fine fettle and, according to Marisa Teixo Cardoso, an expert in child trauma, the group dynamic and shared experience of the group can be used as “dominant emotional factor in their recovery”. As Cardoso said to the Independent : the fact that the boys share the bond of being part of a team can act as an emotional buffer for anxiety and depressive symptoms. This is highly significant – because what the events of the last two weeks tell us above all else, it’s that when human beings work as a team, then remarkable things can be achieved.